The worst thing you can say about creepy-kid horror thriller "Hellions" is that there should be more where it came from. You have to temper your expectations to enjoy a film of this small-scale and ambition to appreciate what director Bruce McDonald ("Pontypool," "The Tracey Fragments") has accomplished here. "Hellions," a "Rosemary's Baby"-meets-"Children of the Corn"-style, what-to-dread-when-you're-expecting chiller, would make a perfect B-movie. McDonald focuses on unnerving ambience over plot, and crafts an effective horror movie that's also basically a home invasion thriller where the home invaders in question are creepy, murderous trick-or-treaters and the home-owner is a pregnant 17-year-old. There is, in other words, nothing new in "Hellions" that you can't get already in earlier, more ambitious horror films. But McDonald delivers an effective thrice-told tale, and he does it with enough avant garde flair to show viewers that temper their expectations a good time. The set-up for "Hellions" is blessedly simple: Dora (Chloe Rose), a typically moody high school senior, discovers she's four weeks pregnant on Halloween. Dora is unsure of how to broach the subject with chops-busting boyfriend Jace (Luke Bilyk) and approachable-but-overbearing mom Kate (Rachel Wilson). In fact, Dora can barely find the words to talk to sensitive gynecologist Dr. Henry (Rossif Sutherland). But Dora doesn't have to wonder what she's going to do for long because she's soon confronted with bigger problems: pint-sized, costumer-wearing kids who start by egging Dora's house, then destroy property and anyone who gets in their way. McDonald and screenwriter Pascal Trottier frequently suggest that the events that viewers are watching unfold could conceivably be all in Dora's head. Their commitment to Dora's wracked point-of-view is selective, but they do often remind viewers—through bath salt and stress-induced dream sequences—that what they're watching isn't strictly objective reality. Dora's body is no longer her own, making the home-invasion analogy a blunt but potent metaphor for her feelings of powerlessness. Other horrors-of-new-mom-dom analogies are effectively used throughout the film, particularly womb-like Jack-o'-Lanterns, and raw chicken eggs splattering on translucent window panes. But again, the biggest shortcoming here is that McDonald and Trottier aren't interested in doing more than what they feel is absolutely necessary to establish mood and tone. "Hellions" consequently only really comes to life when McDonald's signature avant garde flair intrudes, and we're treated to trippy glimpses inside Dora's head. McDonald is fairly non-chalant about these transitions, making random weird-ness—including a sudden in-door tornado—feel perversely natural. Rose-tinted fever dreams, and creepy visions of masked children who giggle and brandish axes are especially effective, but they also fall short of greatness. What McDonald and Trottier don't do is establish Dora's baby-phobia as a symptom of her character and not her age. That's admittedly a challenge given the brief time we get to know Dora. But Rose, clad in a basic halo-and-wings angel costume for Halloween, seems to represent a type, not an individual. We arguably don't need to know much about Dora, but there isn't much in the film about her dreams that don't make her seem like a personality-less cypher. She's supposed to be average, and McDonald refreshingly doesn't stigmatize her teenage pregnancy. In fact, he goes out of his way to show that Doctor Henry is caring, and that both Kate and Jace are friendly enough. Still, Dora's visions of pumpkin patch ghouls and trippy conversations with an alien-sounding interlocutor who keeps urging her to give "blood for baby" aren't specific enough. This robs "Hellions" of specificity, making the best parts of the film feel like an accomplished genre exercise for McDonald, who has delayed his proposed sequel to brainy zombie film "Pontypool" for years now. However, there's something to be said about a relatively small-scale picture whose creators embrace its limitations. 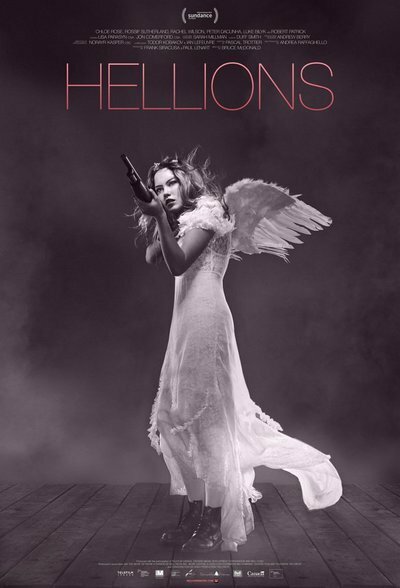 The experimental dream sequences and hallucinations that make "Hellions" a McDonald movie also make the film a perfect, light midnight movie that should go great with light drinks, good company, and a warm blanket. If you're lucky enough to see the film projected at midnight, go for it. This may sound like nostalgic hyperbole, but they really don't make small-scale movies like "Hellions" much any more. It's not without its shortcomings, but "Hellions" gets the job done.